Earth Island Institute's International Marine Mammal Project (IMMP) declared victory in a series of campaigns aimed at Japan's whaling industry. On March 31st, the Japanese company Nissui, owner of whaling ships and a whale meat cannery, announced they would divest their whaling company assets and no longer participate in Japan's controversial "scientific" whaling scheme. Nissui owns part of Sealord Tuna, based in New Zealand. As part of its International Dolphin Safe Tuna Monitoring Program, Earth Island Institute's IMMP launched a boycott against Sealord Tuna in New Zealand, urging the company to divest its whaling industry activities. "The people of New Zealand and Australia refused to buy Sealord Tuna products once they learned that Sealord was involved in whaling," stated David Phillips, Director of Earth Island Institute. "This is the first time we have been able to influence a large Japanese corporation to stop whaling." "Our standards for Dolphin Safe tuna includes provisions that a company cannot be involved in other destructive practices, such as whaling," stated Mark Berman, Associate Director of IMMP. "Our work in New Zealand and Australia publicized the links of Sealord to Nissui and their whale slaughter, and led consumers to take action in the supermarkets across the country." 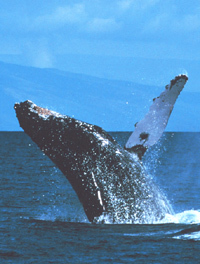 In 1985, the International Whaling Commission (IWC), under pressure from the environmental community, instituted a moratorium on commercial whaling. The following whaling season in 1986, Japan's government countered the move by starting "scientific whaling" to "study" whales. Sealord Group Ltd is New Zealand's largest fishing company, which is 50 percent owned by Nissui (Nippon Suisan Kaisha Ltd). Sealord owns 19 percent of the New Zealand quota in fisheries throughout the EEZ. With joint ventures, the company has expanded to other Southern Hemisphere hoki, orange roughy and toothfish fisheries in the waters of South America, Australia, Antarctic, and the Indian Ocean. New Zealand's anti-whaling reputation has been damaged by the involvement in whaling of Sealord's partner. Sealord has complained that it has been wrongly targeted by campaigns, but its partner has been implicated in whaling. Most observers view Japan's scientific whaling as a ruse to keep up commercial whaling, as the Nissui company benefits from government subsidy of their whaling fleet and cannery, while meat products from dead whales are sold on the Japanese market. The number of whales killed for Japan's so-called research has steadily increased, with 900 minke whales expected to be killed this year in the waters of Antarctica. The IWC has repeatedly passed resolutions urging Japan to drop their scientific whaling operations. Greenpeace and other organizations had joined Earth Island in the Sealord Tuna boycott. Greenpeace, Humane Society of the US, and other groups had also instituted a boycott of Gorton's fish products in the US. Gorton's is also partially owned by Nissui. "This action by Nissui won't end the Japanese government's perverse support for slaughtering whales," noted Phillips. "But it shows that people can profoundly influence the protection of global species by making important choices in the market place. Other companies with ties to the exploitation of whales, dolphin-deadly tuna, and other endangered species should take heed that such crimes against nature will not be tolerated by consumers."